Even Legends have to say "Good Bye"
The king of custom bikes, Arlen Ness, died on 22.03.2019 in the circle of his family at the age of 79 years in California. But his legacy remains – especially for us customizers! Arlen Ness is known for his unmistakable bikes, which have a very individual character and inspired many customizers in the scene. Starting without laser-controlled milling and with real manual work, he developed his company into the world’s leading customizing dealer. Arlen Ness has immortalized his work in numerous bikes such as Untouchable, Two Bad, Ness-Tique, Blower Bike, Ferrari Bike, Ness-Stalgia, Smooth-Ness, Top Banana and Mach Ness. “Although we only met once, i still have fond memories of Arlen Ness. The main reason for this has got to be the fact, that when Thunderbike started out building our first Custom Bikes, Arlen was already the most renowned Entrepreneur in the Field, and I admired his Parts and Bikes in Awe. Yet he always found the Time for some relaxed Smalltalk, even during the big Shows and Bike Rallies. He was one of the great Pioneers of Customizing, constantly moving the Boundaries of what had been done before. What makes him so different from many of the Competitors is that he has always been extremely successful with his Concept over such a long period of Time. In my Opinion, his professional and enthusiastic approach to the Business is the main reason that made him so successful. The fact that he always stayed true to himself, and yet always stayed down to Earth, for me, that makes him a true Legend“, says Andreas Bergerforth, who also got to know Arlen Ness personally. 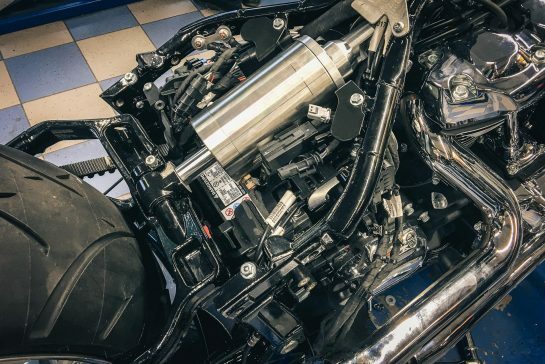 Thunderbike also says “Good Bye” to Arlen Ness – Rest in Peace!